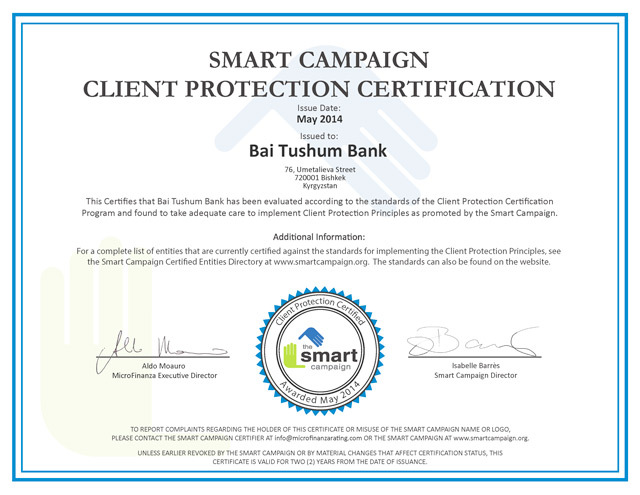 Bai Tushum Bank has been officially recognized by the SMART Campaign as an accordingly operating and fully conforming institution to the 7 principles of client protection, 30 standards and 95 indicators. Certification was conducted by the international rating company MicroFinanza Rating based on a detailed analysis of the internal regulations and activities of the Bank, as well as its corporate culture. “For over 13 years Bai-Tushum Bank has been building relationships with clients based on trust, respect and partnership, identifying their interests as top priority and implementing client protection principles in all aspects of its activities. “Client Protection Principles” International Certificate reaffirms the Bank’s commitment to socially responsible finance and focus on provision of products and services that meet customers’ needs”- said Gulnara Shamshieva, CEO of Bai Tushum Bank. Experts of MicroFinanza Rating international rating company in their report noted that the Bank applies the global best practices in assessment of clients’ paying capacity and implements responsible and transparent practices in financial services. 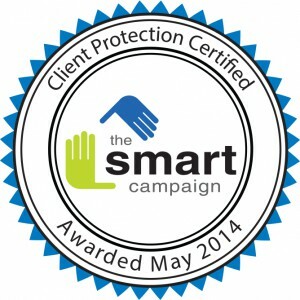 The Smart Campaign is an international company that promotes implementation of client protection practice in the basic culture and everyday activities of microfinance institutions. The Smart Campaign Steering Committee is comprised of respected leaders in the microfinance industry from diverse regions and microfinance institutions. Bai–Tushum Bank has been working in the finance market since 2000, having begun its activity in 1997 as the international project within the “Food for Progress” monetization program carried out by the ACDI/VOCA, the USA NGO. On November 13, 2012, Bai Tushum became the first microfinance institution in Central Asia to be awarded a full banking license from the National Bank of the Kyrgyz Republic. Over the past 13 years, the company grew to one of the leading finance institutions in the Kyrgyz Republic, with total assets of USD 132 million. Today Bai Tushum Bank is one of the top seven largest banks in Kyrgyz Republic, and services over 32 thousand customers.